Sales Funnels are an industry buzz word, and for good reason. Done well, they get results. Should I put a sales funnel to work for my business, and will it bring results? It’s smart to understand where your business is in the grand scheme of things and know your next right steps for growth. Not every business is ready for a long, multi-step sales funnel yet, but every business with a website and an online presence needs a process to begin turning website viewers into leads, and leads into customers. Sales Funnels are that process. Simply put, a Sales Funnel is the pathway that your business creates to allow prospective clients to travel down to connect with you and your brand, to become customers, and to continue to be served by your products or services. One of the first things to establish for an online business is an opt-in sequence. If you aren’t familiar with this phrase, let me explain… When someone lands on your website, you’ll want to offer a way to reach out to this person again. The process in which businesses can keep in touch with these website visitors is to create an opt-in (or freebie, lead magnet, bribe) to entice the visitor to leave their contact information. Your job is to create an exchange of value that the website visitor sees as being a ‘no-brainer’. The price is simply their name and email address, and it’s a valuable tool in growing your business. Upon receiving their information, your sales funnel automatically sends this prospective client an email or download link with their opt-in. But, this is an opportunity to communicate further, and many, many business owners leave money on the table at this point. Don’t stop there. Create an email sequence for the prospect to receive that introduces you, your brand, and tells a story. Generally, this story is about the journey you took, and the ups and downs, epiphanies and fears, on your way to deciding to serve people or businesses in the way that you do. This journey will allow the prospect to get to know you, relate to you, understand the reason behind the need for your product or service, and allow them to feel the impact it can create. This is a basic beginning funnel, and your opt-in is your first, virtual ‘hand shake’. It should feel valuable and should teach the prospect to create a result in a short period of time. But, don’t stop there! You have their attention, and your service has the potential to make a difference in their businesses and/or lives. It’s your responsibility to offer to them a way to work with you to achieve bigger and better things. So, towards the end of our email sequence, we help them to understand the purpose and need for what you have to offer. Then, you make the offer. A small offer at first (usually under $100), but it’s going to allow them to get a win off of something you created, which makes them want to see what else you can do for them, and it allows them to test the waters with paid offers from you. At this point, many beginner businesses with sales funnel processes in place will hop on a call with the client. But, as your available time diminishes and your business gets busier, you need more automation to lead your prospects or customers further down the pathway before reaching you. You’re lifting yourself out of the lower cost portion of your business and working with clients at a higher level. This, my friend, is how we scale a business, and it’s a fantastic way to plow through those plateaus we hit. At this point in time, I take a look at the business and its offers. Some businesses, like brick-and-mortar service based local businesses (ie. gyms, dentists, chiropractors, dance schools…) need a funnel created in which they hop on a call to schedule clients early in the pathway. In this case, we need to be sure to create a funnel that gets the clients excited and interested in picking up the phone or requesting a call, and the business must have their sales conversations in place and have prepared responses to commonly asked questions. Other businesses need to develop offers and create a longer pathway by building in automation (hands-free interaction) to serve their clients and create income. The audience must be considered when creating this pathway (or sales funnel), and the business the funnel is being created for always looks at ways that they can serve their clients in the best way possible. This focus on service is a main key to success. So, if you want to turn website viewers into leads and then into customers, you’ll be well served with a sales funnel. To answer the question of ‘How To Know If Sales Funnels Are The Answer To Growing Your Business’, every online business needs an automated sales funnel, but some funnels should be longer than others. It depends on the business and how it serves. 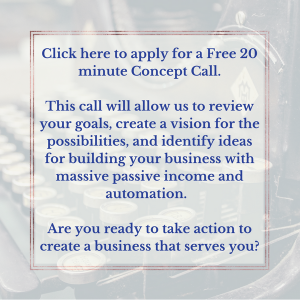 If you’re interested in looking at the next steps in creating a funnel that brings in business, click here to fill out a short application for a call with me, where we’ll discuss your goals and what’s needed to reach them. Helping entrepreneurs and businesses succeed is the name of the game. Are you in?